Archaeologist Olivia Navarro-Farr discovered the tomb of Lady K'abel, a Maya warrior queen: GlobalPost asks her about the find and its remarkable historical meaning. The tomb of a Classical Mayan queen has been discovered in Guatemala, in a remarkable find that sheds new light on the role of women in early Mesoamerican cultures. To find out more about the queen, known as Lady K'abel, and the findings at the El Peru-Waka archeological site, we spoke with the woman who discovered her tomb: Wooster University archaeologist and assistant professor of anthropology Olivia Navarro-Farr. Lady K'abel ruled the Guatemalan city of El Peru-Waka with her husband, K’inich Bahlam, during the 7th century from 672 to 692, serving as the military governor of the Waka kingdom under the auspices of the House of the Snake King, to which she belonged. Her official title was "Kaloomte," or Supreme Warrior — which meant that she outranked her husband. 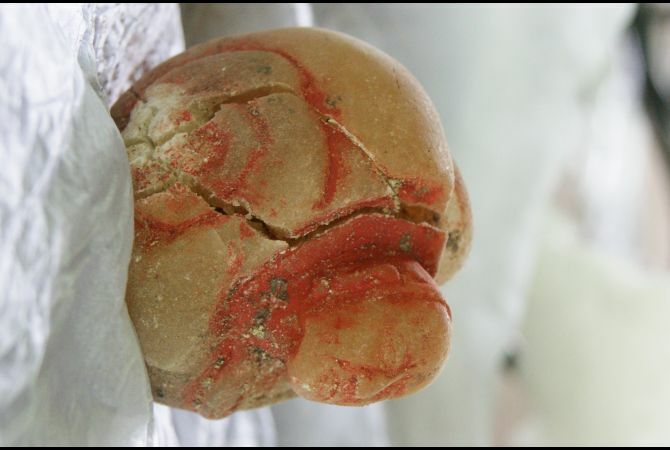 Her identification was confirmed by project epigrapher Stanley Guenter in his reading of a series of glyphs inscribed on a small alabaster jar from the tomb. 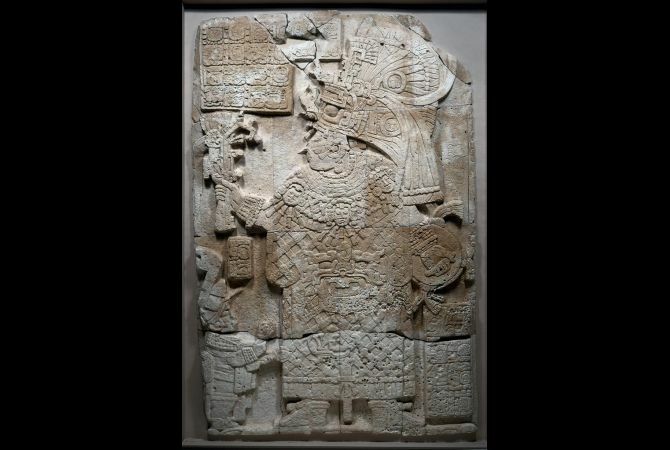 "She's portrayed on Stela 34 (on display at the Cleveland Museum of Art) wielding a shield and she is accompanied by a dwarf figure, which would have been a member of the Royal Court," says Navarro-Farr. "She had a long life, and she was a powerful woman who was depicted as such. That's important, because history remembers her as a formidable figure with a supreme title." Navarro-Farr says that Lady K'abel’s remains — analyzed by Tulane Graduate student Erin Patterson, indicated she had a robust frame. She was found with a ceramic plate over her left arm, likely representing a shield. "She's an exceptional kind of woman, from a historical standpoint," says Navarro-Farr of Lady K'abel. "She was a strong, politically savvy and important person, and I think [her tomb] does provide new kinds of evidence that shed light on the key role of women in dynastic rulership." "This gives some real idea of who she was as a human being," says Navarro-Farr of the discovery, noting that Lady K'abel was previously only known to history via art and fragments of text. "[The find] grounds her in a material world," says Navarro-Farr. "We have a much more comprehensive understanding of who she was now." "I know it was a proud moment for everyone involved, including my collaborator Griselda Perez, and a proud moment for women professionally, and archaeologically, and broadly, across careers. It's really great to see this in antiquity, this powerful warrior woman," says Navarro- Farr. What does this find say about the role of women in Mesoamerica? Archaeologists have tended to assume women held subordinate roles in classical Maya society. The discovery of Lady K'abel's tomb and the nature of her burial, however, tells a very different story — and may shake up some popular assumptions about ancient Maya social organization. "Finds like this challenge antiquated perspectives about roles and contributions by men and women in ancient societies," says Navarro-Farr. "There was a time when archaeology was male dominated, and there were assumptions about gendered divisions of labor and a general projection of contemporary ideas about gender roles onto the past," she says—and a finding like this alters the power dynamic. "You know, this is not unique," she adds. "There are other archaeologies and other examples of this paradigm or this idea [that is] jarred. And it's always great to see." How long have you been working at this site? Why did it take a while to find Lady K'abel's tomb? "The project conducted a brief reconnaissance in 2001, but actual archeological excavation began in 2003 and has grown from year to year since that time," says Navarro-Farr of the El Peru-Waka site. "My excavations at this building [where Lady K'abel's tomb was found] were of a slightly different focus in those earlier years. After collecting data on the final phase of the building and the significance and ritual of the building, I was curious to know why there was so much evidence for ritual activity there," she says. "Now to understand a royal woman was buried there — it certainly bookends the research question quite nicely. To have it addressed so comprehensively, to have this find associated with this figure is really profound." There are a few reasons why Maya civilization is the only "classical" culture described in Mesoamerica, says Navarro-Farr. Firstly, like ancient Greek or Roman cultures, the archaeological record of the ancient includes decipherable ancient texts, that is, a historical record. "Classical refers to text and other cultural evidence found in tandem with other archaeological evidence," she says. Secondly, their written language was a syllabic language, which is unique among pre-Colombian writing systems, says Navarro-Farr. "One thing that distinguishes the Classic Maya, in terms of reference to classical civilizations, is that they developed a grammatically structured syllabic language that has been deciphered by generations of scholars," she says. "Maya writing is associated with the apogee of dynastic rulership," says Navarro-Farr, who emphasized the ability to write and read was likely restricted to elite members of the royal court. "Why the Maya chose to develop the writing system they had, while other peoples in Mesoamerica did not, is something we're going to be talking about as long as we're doing archeology in Mesoamerica." Finally, classic Maya art had a uniquely humanist quality to it making it reminiscent of the work of the Greeks or Romans, who labored to portray real people in their artistic renderings. Navarro-Farr references the alabaster jar found with Lady K'abel, which portrayed a realistically aged woman, instead of an idealized portrait. Across Mesoamerica we see different styles of art," says Navarro-Farr. "The Maya portrayed individuals in humanistic rendering. The royals, gods, embodiments of divine power are in fact human people, and they're depicted as such."